"A tear, Sarah Jane? Don't cry. Where there's life there's..."
And so all good things come to an end. Jon Pertwee's final season continued with 'Invasion of the Dinosaurs' which, as it title suggests, sees London being invaded. By dinosaurs. Actually the dinosaurs are fairly incidental to the story. 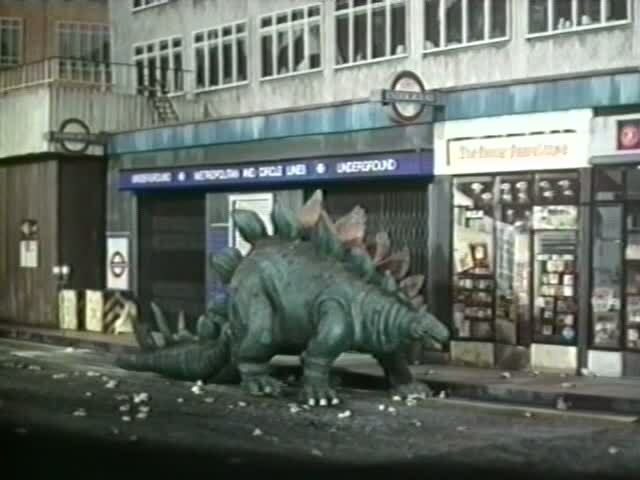 The Doctor and Sarah have returned to present-day London to find it empty as a result of the aforementioned dinosaurs suddenly appearing out of nowhere. Investigating these mysterious appearances they uncover a conspiracy that seems to implicate almost everyone they meet. Including Captain Mike Yates. Yes, for I think the first time in Doctor Who we see one of our heroes suffer a fall from grace. Yates has thrown in with the people behind 'Operation Golden Age', a secret project that wants to make the world a better place by taking it back to the past. Mike's job is to ensure that no one (including the Doctor) gets too close to discovering the truth. Of course Mike doesn't know the whole truth himself which is that those behind Operation Golden Age literally want to take the world back to the past by turning back time and wiping out almost every living person. Once he realises that he's been lied to, Mike helps the Doctor to save the day once more. The next story, 'Death to the Daleks' sees Sarah's first trip to another and, to be frank, it's a bit of a dump. I'm also not entirely sure what the relevance of the title is. 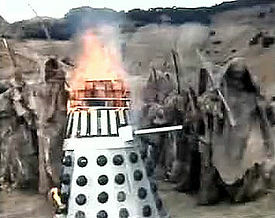 Sure, there are Daleks in it but no one seems to wish death on them. Admittedly they do come out of the story having taken a bit of a battering but that's standard practise for most of their TV appearances so why appear to draw attention to it in the title? As mentioned above, the Daleks have returned once again but, in an interesting twist, they are forced to work with the Doctor rather than trying to kill him. The reason for this is that the Daleks, along with the Doctor, Sarah and a group of space-faring humans, are stranded on a primitive planet which has somehow drained every machine of power. 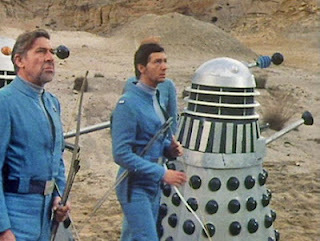 With no weapons at their disposal the Daleks are forced to rely on others. to ensure their survival. Naturally the Daleks alliance with the others doesn't last long (not even past episode 2 in fact) but for a few minutes it's interesting to see how Daleks react when they realise that they're no longer the toughest kids in the playground. 'The Monster of Peladon' is, perhaps not surprisingly, a sequel to 'The Curse of Peladon' and sees the Dcotor, with Sarah rather than Jo this time, returning to the planet last seen in 1972. King Peladon is dead and his daughter is now Queen. However fan favourite character Alpha Centauri is still present as are the Ice Warriors, in what would be their final appearance on TV for almost 40 years. And so all good things must come to an end. 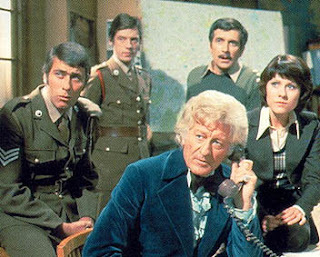 'Planet of the Spiders' marks the end of the Third Doctor;s era and, quite fittingly, the story draws on elements and characters from throughout the Pertwee era to create a fitting finale. When Jo left to get married the Doctor gave Jo a rare blue crystal from the planet Metebelis 3 as a wedding present. 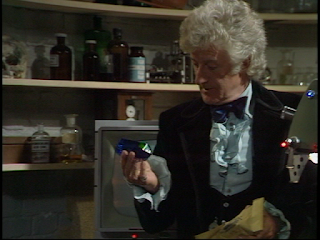 Here, she returns the crystal to the Doctor claiming that it's been bad luck. 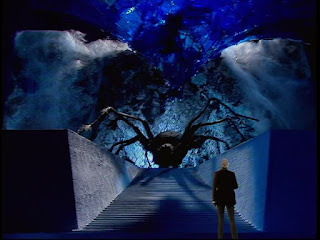 How right she is as it turns out the crystal is wanted by the current rulers of Metabelis 3, a group of giant spiders. The Spiders come to Earth to reclaim the crystal and arrive in a Buddhist retreat deep in the English countryside. It just so happens that this retreat is currently home to former UNIT Captain Mike Yates. Mike, having been discharged from UNIT following his actions in 'Invasion of the Dinosaurs', is here given the chance to redeem himself by assisting the Doctor one more time. Also resident at this retreat, in what must be a huge coincidence, is the Doctor's old mentor from Gallifrey and whom the Doctor had previously spoken of back in 1972's 'The Time Monster'. Going by the name K'Anpo Rimpoche, the Doctor's old teacher has chosen to leave Gallifrey and has set himself up as Abbot of this retreat. It is he who makes the Doctor realise that everything that has happened during this story is the Doctor's fault. 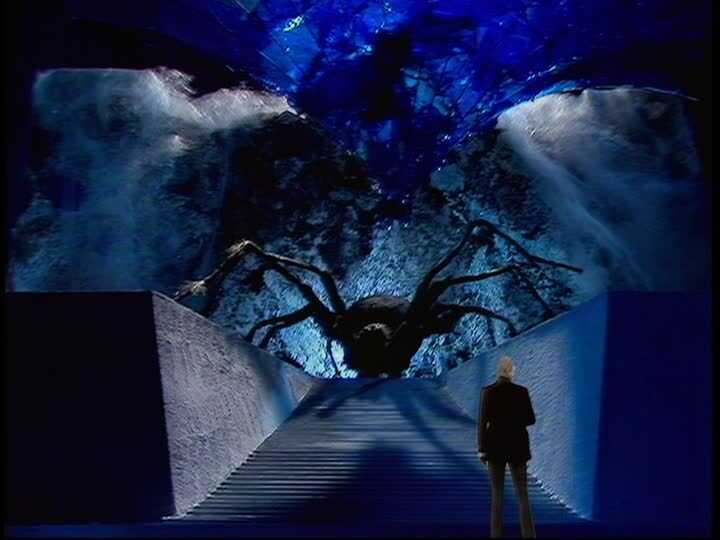 It was the Doctor who originally stole the crystal from Metabelis 3 and who set events in motion that led to the Spiders coming to Earth. The Doctor realises that only he can put things right and that he may have to sacrifice himself in the process. In addition to the annual treat that was the, well, Annual, readers could now also enjoy more novelisations of a number of the TV stories. As you'll recall, in 1973 Target books re-released the three First Doctor novelisations from the 1960s. They decided to follow this up with further novelisations of some of the more recent stories. All they needed were writers. Enter: Terrance Dicks. 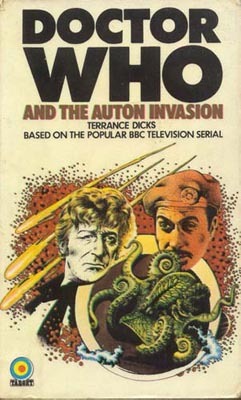 Dicks was still acting as script editor for the TV series when he wrote his first book, the novelisation of 'Spearhead from Space' which was retitled 'The Auton Invasion' when it was published in January 1974. At the time he little knew that this little book would open up a whole new career for him. Suffice to say, his name will come up on a regular basis throughout this blog. 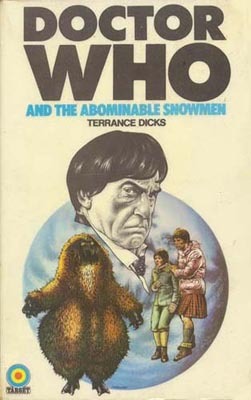 Later in the year, Dicks would also write novelisations for 'Day of the Daleks' and Second Doctor story 'The Abominable Snowmen'. However, Dicks wasn't able to write all the books that Target were asking for. 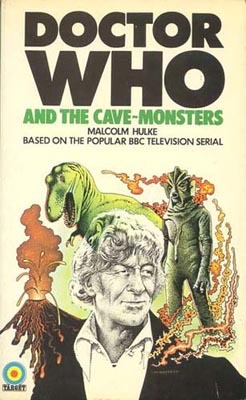 His friend and fellow Who script writer, Malcolm Hulke, was drafted in to assist and novelised his own scripts: 'The Silurians' (retitled 'The Cave Monsters'), 'Colony in Space' (aka 'The Doomsday Weapon') and 'The Sea Devils'. 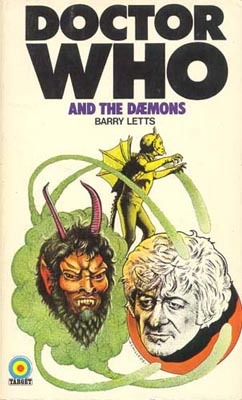 Even Producer Barry Letts got involved, novelising 'The Daemons'. Perhaps not surprisingly, 1974 was the final year of regular Third Doctor comic strips. Throughout the year he encountered a variety of different alien menaces, including metal eating insects, the Lords of the Ether and, once again, the Daleks. The final Third Doctor comic strip, entitled 'The Wanderers' coincided with the first full on-screen appearance of the Fourth Doctor. From early January 1975 there would be a new face in the comic strip. December in the world of theatre usually means pantomime. But, for the Adelphi Theatre in London, December 1974 meant Doctor Who. Yes, for the first (but not the last) time, Doctor Who was treading the boards. 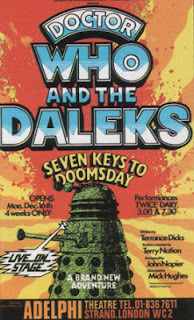 The play was called 'The Seven Keys to Doomsday' and was written by the ever-busy Terrance Dicks. It was originally written with Jon Pertwee in mind to play the Doctor but with Pertwee having just left the TV series and Tom Baker yet to debut fully, the role of the Doctor fell to Trevor Martin. Martin had previously appeared in Doctor Who playing, rather appropriately, a Time Lord. In this play he was effectively playing an alternative version of the Fourth Doctor. A regeneration was re-enacted on stage to explain the presence of this new Doctor. He was then joined by two young people from the audience who became his companions for the duration of the play. The two youngsters, Jenny and Jimmy, were, of course, actors planted in the audience. Interestingly, Jenny is played by Wendy Padbury who previously played Second Doctor companion Zoe.